Albert Arnold "Al" Gore, Jr. is an American politician and environmentalist who served as the 45th Vice President of the United States from 1993 to 2001 under President Bill Clinton. He was Clinton's running mate in their successful campaign in 1992, and was re-elected in 1996. At the end of Clinton's second term, Gore was picked as the Democratic nominee for the 2000 presidential election. After leaving office, Gore remained prominent as an author and environmental activist, whose work in climate change activism earned him the Nobel Peace Prize in 2007. 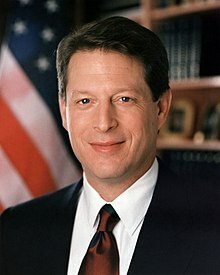 Albert Arnold "Al" Gore, Jr. (born March 31, 1948) is an American politician and environmentalist who served as the 45th Vice President of the United States from 1993 to 2001 under President Bill Clinton. He was Clinton's running mate in their successful campaign in 1992, and was re-elected in 1996. At the end of Clinton's second term, Gore was picked as the Democratic nominee for the 2000 presidential election. After leaving office, Gore remained prominent as an author and environmental activist, whose work in climate change activism earned him (jointly with the IPCC) the Nobel Peace Prize in 2007. Gore was an elected official for 24 years. He was a Congressman from Tennessee (1977–85) and from 1985 to 1993 served as one of the state's Senators. He served as Vice President during the Clinton administration from 1993 to 2001. In the 2000 presidential election, in what was one of the closest presidential races in history, Gore won the popular vote but lost in the Electoral College to Republican George W. Bush. A controversial election dispute over a vote recount in Florida was settled by the U.S. Supreme Court, which ruled 5–4 in favor of Bush. Gore has received a number of awards including the Nobel Peace Prize (joint award with the Intergovernmental Panel on Climate Change, 2007), a Grammy Award for Best Spoken Word Album (2009) for his book An Inconvenient Truth, a Primetime Emmy Award for Current TV (2007), and a Webby Award (2005). Gore was also the subject of the Academy Award-winning (2007) documentary An Inconvenient Truth in 2006. In 2007, he was named a runner-up for Time's 2007 Person of the Year.